Amaryllis flowers are gorgeous, and they come at a perfect time of year – when, for many of us, the gardens outside are sleeping! I know Amaryllis can get pretty big, but I never imagined this big. I’d say the leaves were about 2 1/2″ wide or more and 4 feet or more tall. The flowers were probably double what we’re used to seeing and same with the bulbs. I didn’t know they could get that big! At that point, I didn’t even know they could be grown for flowers year to year. Now I know differently and I’ll tell you what I have learned. » Amaryllis prefer a sandy loam. Purchase a professional soil mix for bulbs, or make your own by mixing one part sand, one part loamy soil, and one part leaf mold or composted manure. » Amaryllis prefer to be slightly pot bound, so choose a pot with no more than one inch of space betweeen the bulb and the edge of the pot. Place a half inch of gravel or some clay pot shards on the bottom of the pot for drainage. » Leave one half to two-thirds of the bulb above the soil line when planting. Leave a half inch from the soil line to the top of the pot for ease when watering. » Keep soil evenly moist until flowering, then increase waterings to promote long-lasting blooms. » When foliage wilts, remove it from the plant. Cease watering and store the pot in a warm, dry area during the dormant stage. When it is time to restart the growing cycle, place the potted bulb in a southern window and begin watering and fertilizing again until the bulb re-flowers. Late October is the ideal time to plant, after the bulbs have gone through a dormant period. If there are off shoots, you can take them off and plant them as new plants. Use a small pot in relation to the bulb size. Clay or ceramic pots would be best because they are heavier and will help keep the plant from toppling over. Give only an inch of room for soil on the sides of the bulb. Amaryllis prefers a sandy-loam soil mix. You can mix your own by combining one part leaf mold or composted manure, one part loamy soil, and one part coarse sand. Some garden centers also sell soil mixes especially for bulbs. When you plant the bulb, keep the upper half out of the soil. Water thoroughly after planting and keep the soil slightly moist until flowering. At flowering, increase waterings to prolong flowers. The blooms will last 6-8 weeks depending on temperature, light and variety. When grown in the home, Amaryllis need as much sun as they can get! A southern window is best. They prefer 70-75 degrees for best growth. But when the plant begins to flower, cooler temperatures (60-65 degrees) will extend the blooms. As mentioned above, my neighbor had his in his windowed laundry room. The windows were southern and western which means lots of sun. One more important tip is that a laundry room produces humidity so this is something else they like. Fertilize at half the recommended rate of any water-soluble fertilizer every 6 weeks or so. Fertilizer will determine the size and quality of flowers and foliage. Good quality bulbs may produce up to six flowers on a single stalk. When a flower fades, cut the stalk about 2″ from the base. This will save energy for the other flowers. Don’t cut the foliage because this is next year’s food for next year’s flowers. Keep watering and fertilizing the foliage as you would before flowering until next September. At this point, put the plant into a warm, dark and dry place such as a closet. Don’t water or fertilize during this rest period. Then late October, move it back to the sunny window and start the process all over again. 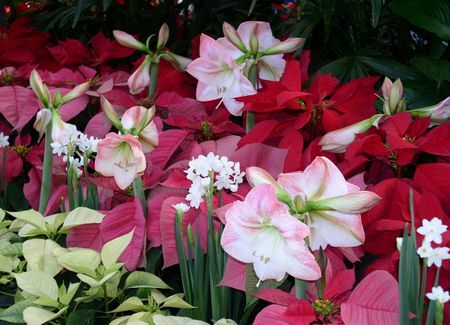 When properly cared for, Amaryllis can flower for up to 75 years! So take care of yours for years of gorgeous flowers.